Hello, about a week ago I was contacted to do a week long of Kardashian outfits. Inspired from what they wore in Miami in support of the Kourtney and Kim Take Miami premiere on E! this Sunday. I was gifted a couple of items from the Kardashian Kollection from Sears and I will be giving away a surprise gift from their collection to one lucky commenter… all you have to do is to leave a comment of course including your email of contact on any of the Kardashian outfits I will be recreating this week. The winner will be announced on my Facebook page along with the winners of my other 2 giveaways, which are still open so check those out too. Goodluck to all of you! Hola, hace una semana me contactaron para hacer una semana entera de looks de las Kardashians. Inspirada en lo que usaron en Miami cuando grababan Kourtney and kim take Miami que empieza este domingo. Me regalaron varias cosas de su collection en Sears y estare regalando un premio sorpresa de su collection. Selecionare al ganador de los comentarios dejados en cualquier Kardashian look que haga post esta semana, claro porfavor deja tu email también y la ganadora será anunciado junto con los otros dos ganadores de los giveawys que siguen abiertos… si quieres participar en esos también siguen abiertos. Buena Suerte a todas! That color looks great on you! :) love it! Congrats on this opportunity!! Can't wait to see all of the looks! Me encanto y los zapatos estan geniales! 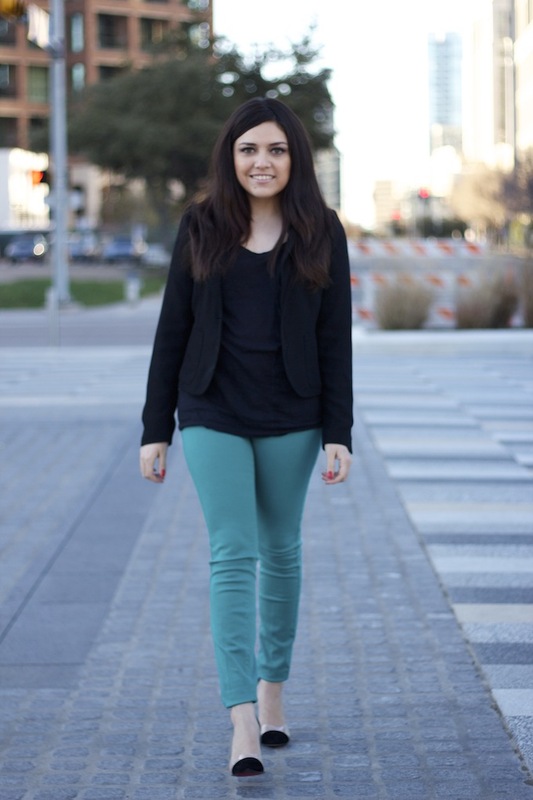 Love the pants - what a great pop of color, and you look adorable! Love Kim and love this look....you do such an amazing job with celebrity inspired looks. Love love love those shoes!!!!! Very cute love the shoes!!! Would love to have anything Kardashian's ! Felicidades! Este look es super sencilllo pero me encanta! Simple but cute! :) love the jeans. Follow you on bloglovin, twitter, fb, & ig. Love this outfit! You look amazing! The green pants are incredible! I have ordered the same pumps!! are they comfortable? ?